Maria Kabushinskaya, PA-C, moved to Florida from Russia in 2008. She obtained her BS in interdisciplinary studies with a minor in chemistry from the University of Central Florida. After spending a year in the Stem Cells Research Laboratory at UCF, she attended the Adventist University of Health Sciences and obtained her MS in physician assistant studies. 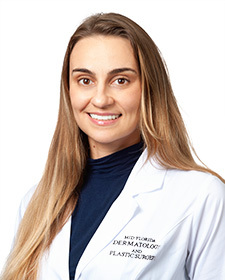 Maria has trained extensively with Dr. Michael Gutierrez and other board certified physicians in the dermatology specialty. She is a member of the American Academy of Physician Assistants and the Florida Society of Dermatology Physician Assistants.